On Wednesday, February 8, at 7:00 p.m. in Northen Auditorium, Marc Conner, interim provost and Jo and James Ballengee Professor of English, and Lucas Morel, professor of ethics and politics, will present the John Chavis Lecture in African-American Studies. 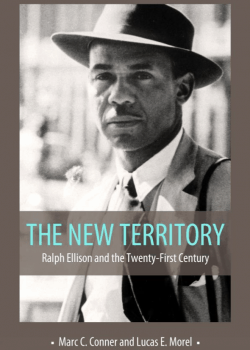 Titled “The New Territory: Ralph Ellison and the 21st Century,” the presentation will focus on elements of Conner’s and Morel’s co-edited volume of that title that was released this past fall. Gathering the work of 15 major Ellison scholars, the book examines the achievement and relevance of Ellison’s writing for the America of the 21st century. John Chavis was the first African-American to attend Washington and Lee University (then Liberty Hall Academy). The Chavis lecture, created by Associate Dean of Students Tamara Futrell, honors Chavis’s memory by featuring the work of Washington and Lee faculty who are doing research in the fields of African-American Studies. The lecture is sponsored by the Office of Student Affairs, the Office of the Provost, and the Office of Diversity and Inclusion, and is part of the University’s celebration and commemoration of Black History Month. The lecture and reception following are free and open to the public.